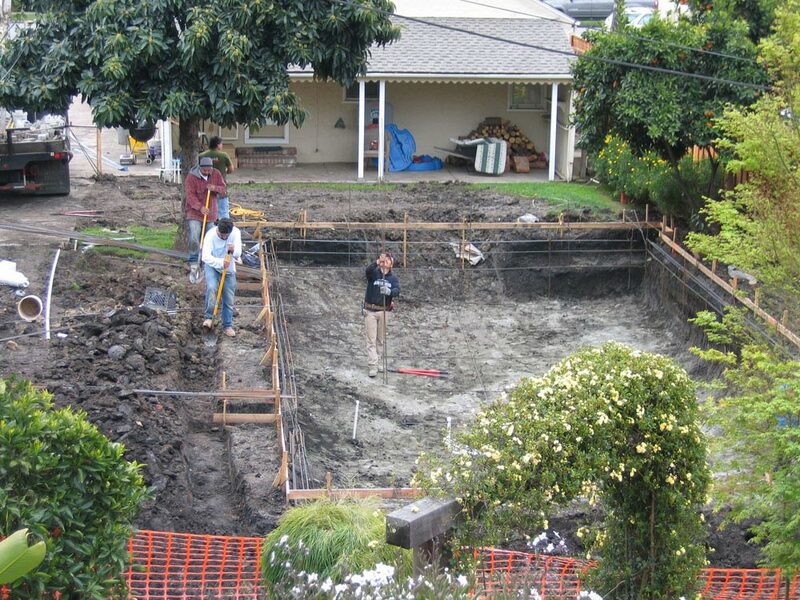 We've decided to get a swimming pool. Unlike my deck, which I built myself, this time we're paying someone else to do it. 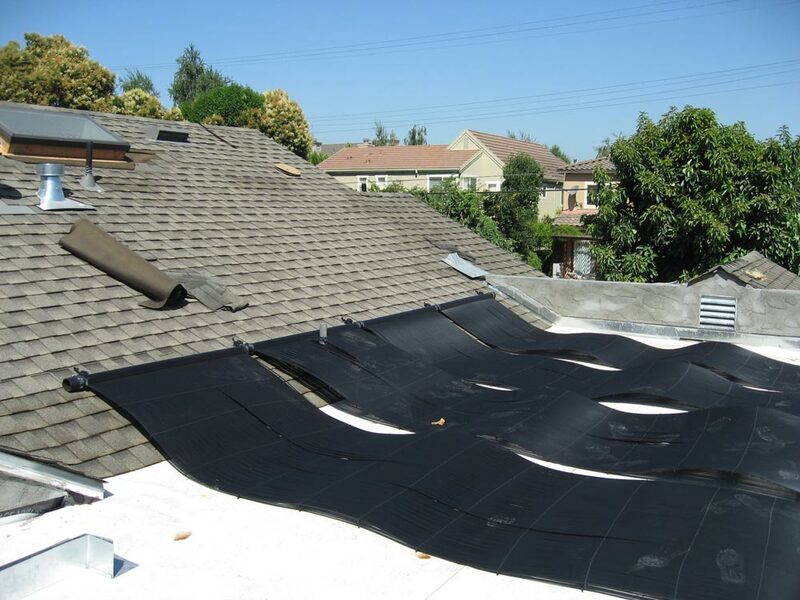 After getting a couple of quotes we picked Swan Pools, not because they were the cheapest, but because they offered features the other pool companies didn't, most notably the "hidden lid" pool cover. That means that the automatic pool cover retracts into a slot in the end of the pool, and is almost completely out-of-sight when open. 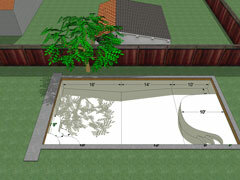 Met with Mike Blackburn, the Swan Pools salesman, to sign the contract. Mike was the reason we picked Swan Pools. He had a lot of good ideas and advice. 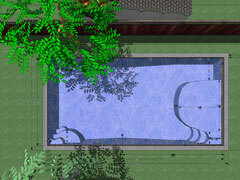 For example, we originally wanted a sloping "beach entry" into the pool. Unfortunately we also want an automatic motorized cover for safety, and the two don't go together very well. The sloped area ends up not being covered, and dead leaves collect in the shallow water there. 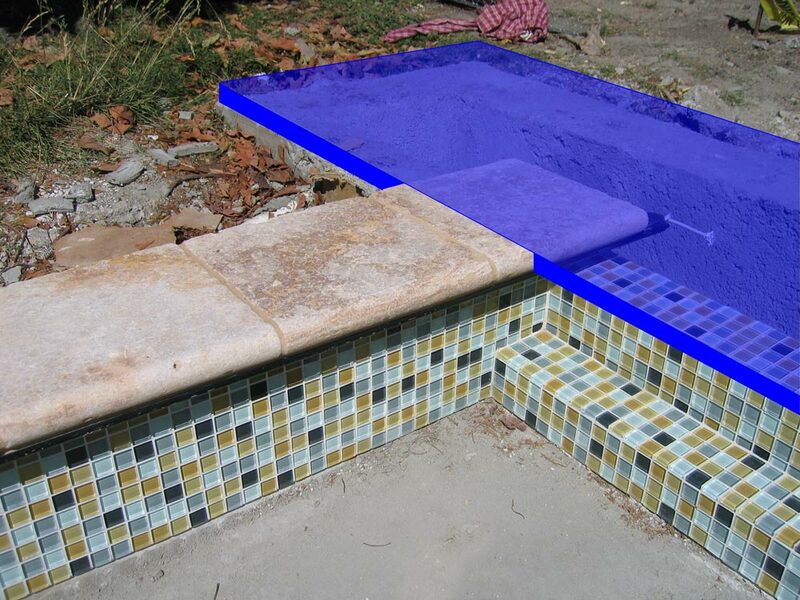 Mike suggested instead that we conceptually drop the sloping "beach entry" by six inches, turning it into a large flat shelf just about an inch below the water level. 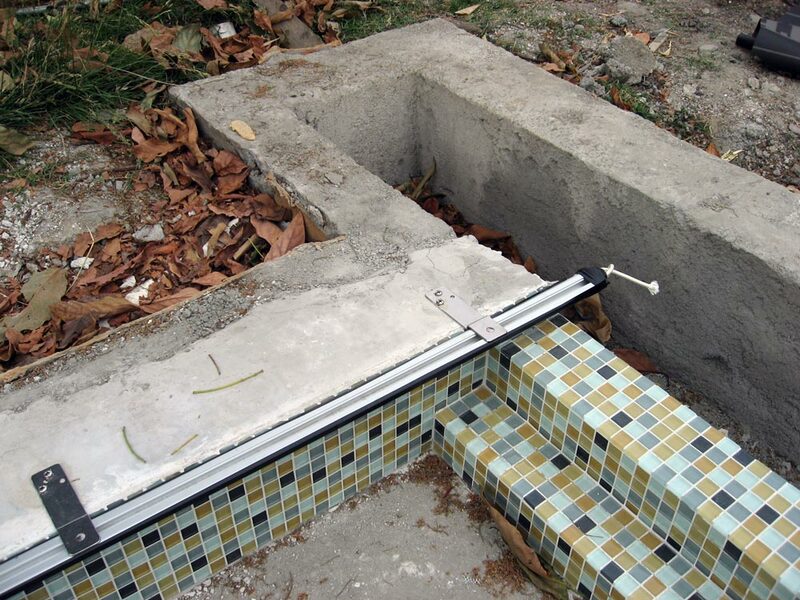 That way the motorized cover can completely enclose it, but we still have a large shallow area for children to play. 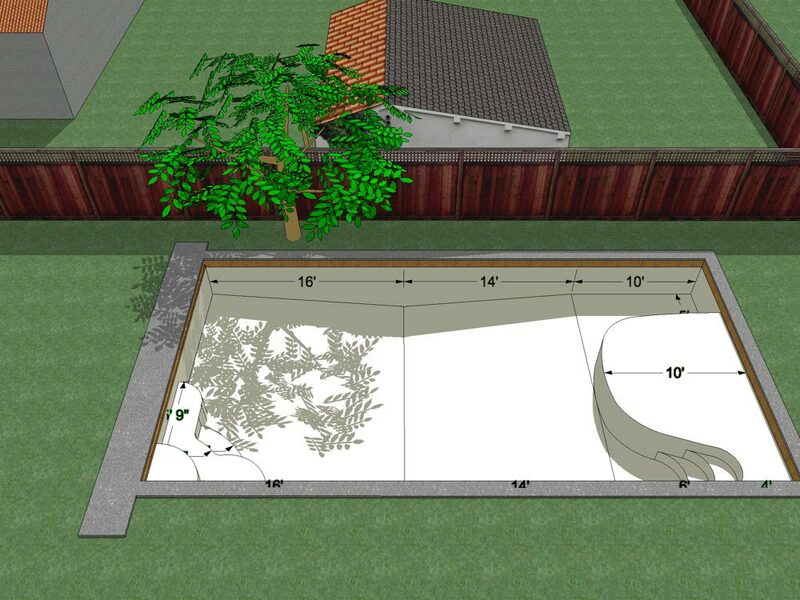 We experimented with various ideas, and ended up deciding to have what's basically a 30-foot pool with an attached 10-foot shallow shelf, with a 40-foot motorized cover which will completely enclose both when not in use. 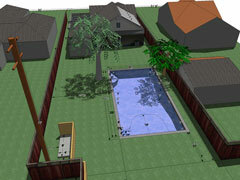 To help us visualize it before construction started, I prepared a 3D model using the amazing 3D software SketchUp. Looking at the 3D view, I realized that if we left five feet clear beside the shelf, we could have a full-length lane for swimming laps as well. At the end opposite the shelf we designed some steps and a small seat, to aesthetically mirror the S-curves of the large shelf and steps. 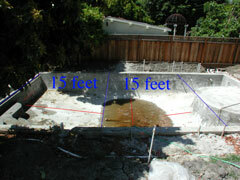 In the 30-foot pool section we decided to have the deepest part in the middle, rather than at one end. This is what they call a "sport pool". 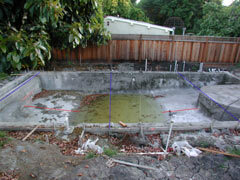 It means you can run a net across the middle of the pool for playing games like pool volleyball. If the deepest part is not in the middle, then one side is standing in shallow water while the other side is treading water, and the game is so one-sided that it's not much fun for anyone. 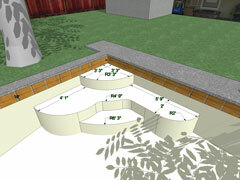 The estimated completion date on the contract from Mike Blackburn is Tuesday 2nd May 2006. 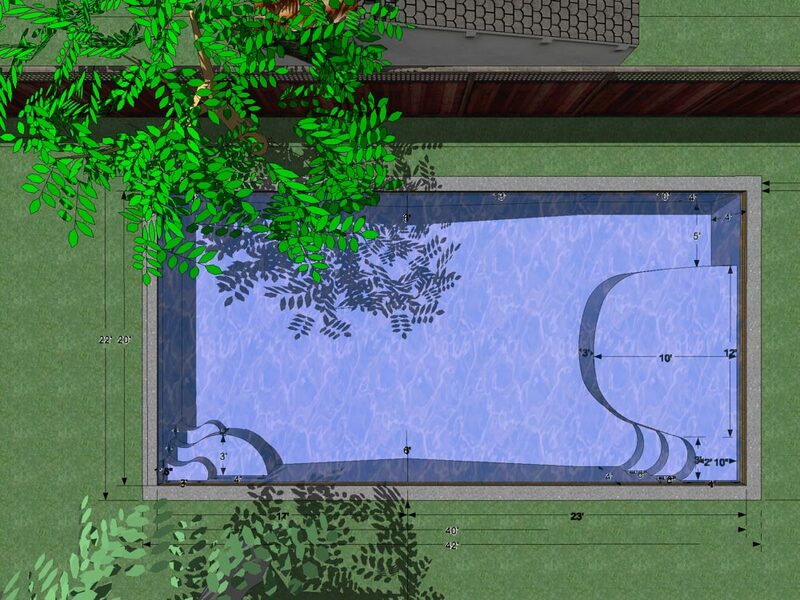 In the images on the right, I had SketchUp calculate the shadows for 2pm on Saturday 6th May. Swan's foreman Tom arrived today to mark out the pool boundaries. Arno, Tom's boss, had told me that today's plan was just to mark the boundaries, but they'd have to wait for a dry day to actually dig the hole, because if they tried to dig in heavy rain the sides would collapse. 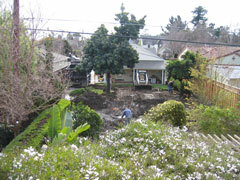 Well, that information turned out to be wrong, and they did start the excavation today. 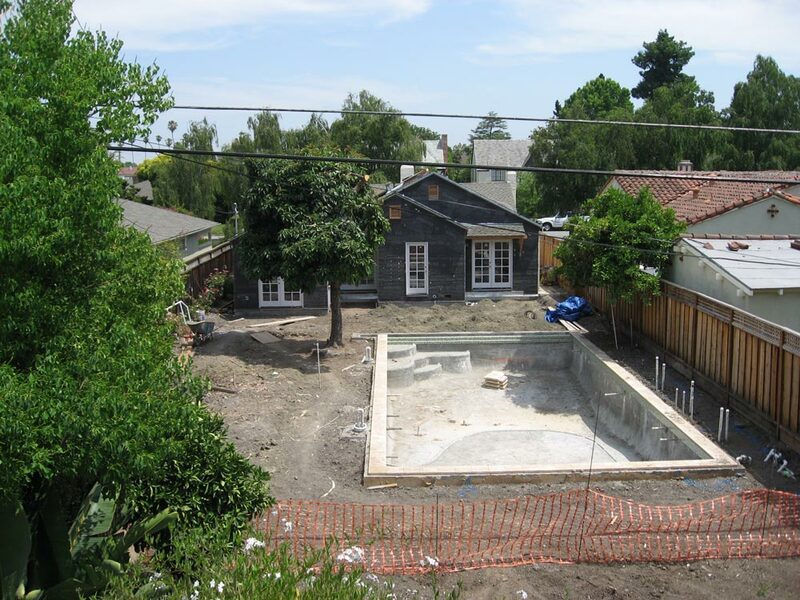 Today they completed the excavation and installed the wooden forms that mark the pool boundary. Today they installed the plumbing and the steel reinforcing bars for the concrete. Today they applied the Gunite. 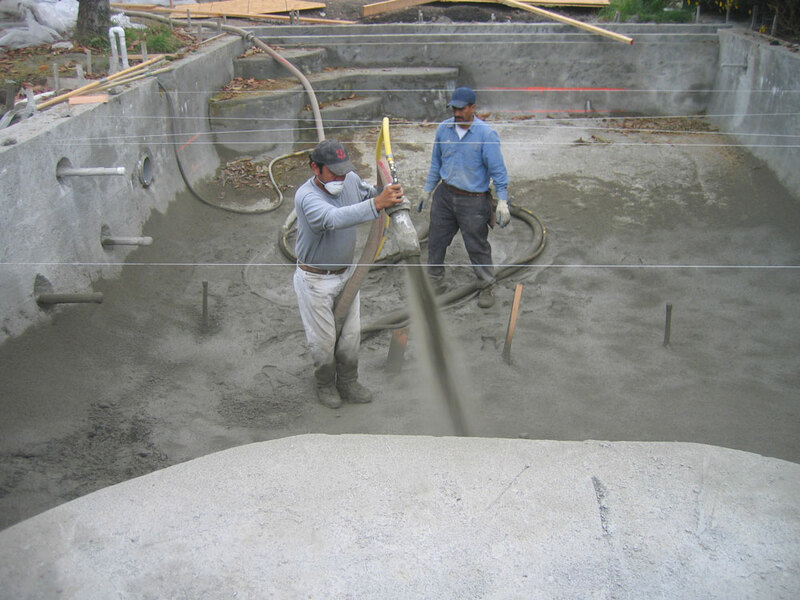 Gunite is a kind of sticky concrete they spray on with a hose. It's so sticky that they can mold it into whatever desired shape they want, almost like building the pool out of child's modelling clay. It was raining so hard that they had to cover the whole pool in plastic sheets to stop the rain washing the concrete away. According to Weather Underground today was the wettest day of the month, with 0.73 inches of rain, ten times the historical average for this date. If the concrete cures too fast, it cracks, so for a week you have to hose it down several times a day to keep the surface damp. When I peeled back the plastic sheets to start hosing it down, two problems became evident. One problem was the steps/seating in the corner. 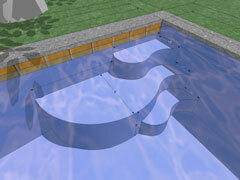 On the 3D model we made (see picture above), we had a small first step, a second large step/seat, and a third step. The third step was completely missing, replaced instead by a dangerously steep sloping ramp. Apparently the people digging the pool were working off the wrong set of plans, and didn't dig it deep enough at that point. The other problem was the location of the deepest point. 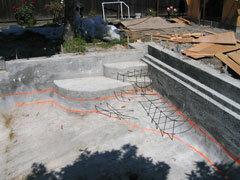 Our plan was to have a ten-foot shallow shelf adjoining a thirty-foot deep area. 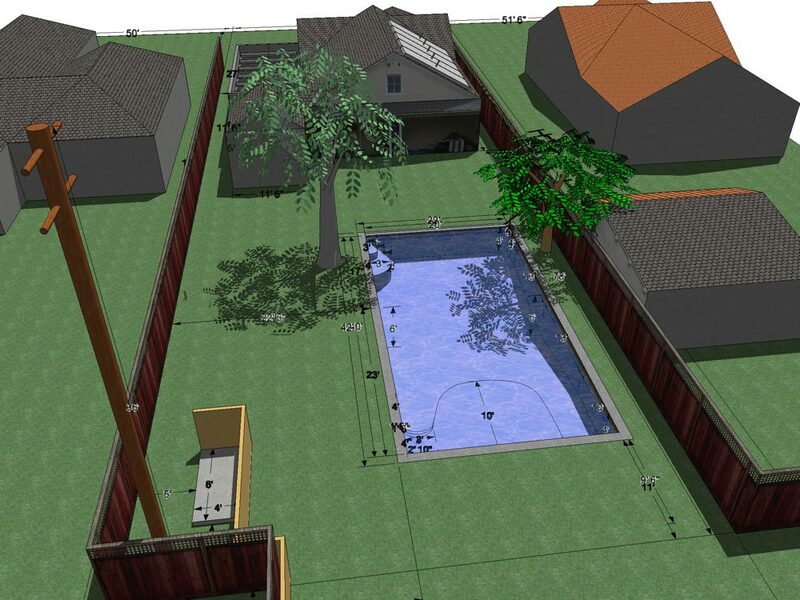 So that we could put a net across and play pool sports, we wanted the deepest point in the middle of that thirty-foot section, to make it fair to both sides. Instead of putting the deepest point in the middle of the thirty-foot section (blue line), they've placed it so that there's about twenty feet on one side and only ten feet on the other (red line). 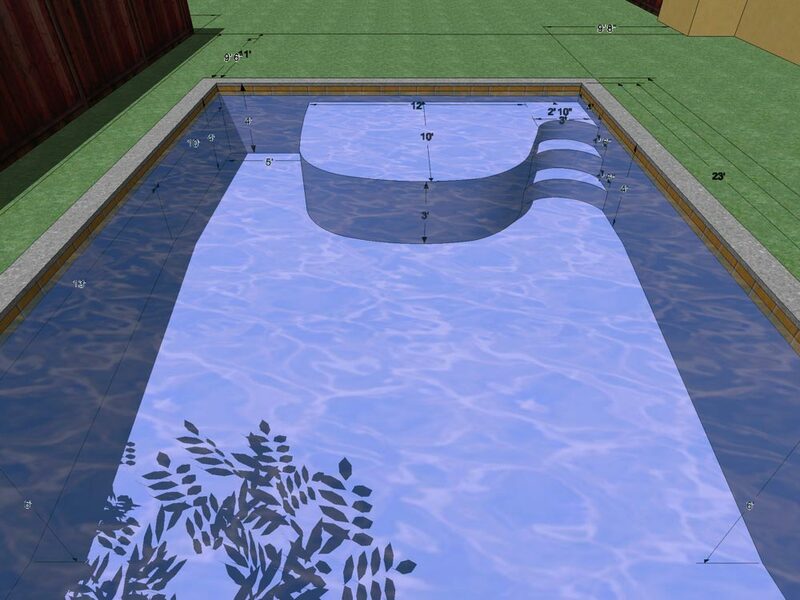 It's obvious from where the puddle of water is collecting that there's a lot more pool floor to the left of it than there is to the right. Waiting for someone from Swan Pools to come and look at the pool and work out how they're going to fix it. Just five weeks left now before Swan's estimated completion date. Still waiting for someone from Swan Pools to come and look at the pool. Four weeks to Swan's estimated completion date. Three weeks to Swan's estimated completion date. Mike Blackburn finally came to look at the pool. He agrees it's wrong, and says Swan Pools will fix it. Rather than make them dig it up and completely redo it, we've agreed to let them build a larger seat area to cover the bulge, and simply relocate the drains four feet to the left, and then fill in the pool a little on the right to make it slope down to the new drain location. The new deepest point will now be about 5 feet, about six inches shallower than planned. Waiting for Swan Pools to resume work. Two weeks to Swan's estimated completion date. 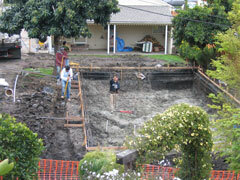 Still waiting for Swan Pools to resume work. One week to Swan's estimated completion date. Swan's original estimated completion date is tommorrow. One week past Swan's estimated completion date. Finally, Swan resumes work, installing the new steel reinforcing bars for the new seat to cover the bulge in the concrete floor. The orange lines are horizontal contours one foot apart that I spray-painted on the concrete. The lower contour line marks the region that the new seat and step need to enclose to cover the bulge. 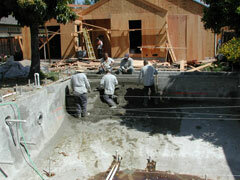 The Gunite crew arrived to fix the pool. The workmen did a great job, but unfortunately, someone messed up the work order and they only brought enough Gunite for the new seat, not to fill in the middle to relocate the deepest point. Still waiting for Swan Pools to tell us when the Gunite crew will be back to finish the repairs. Two weeks past Swan's estimated completion date. 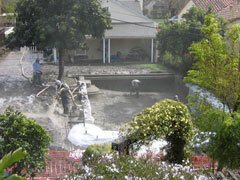 The Gunite crew is back again to finish the job. By adding more Gunite to raise the level of the pool floor on the right side, the deepest point is now more-or-less where we want it. It's perhaps still a little to the right, but it's close enough that we can play games without it being grossly unfair to one side. Monday 22nd May, What's Next? Three weeks past Swan's estimated completion date. We're now four weeks past Swan's estimated completion date, and Swan tells us that the tile installers are all booked up for at least the next six weeks. The scheduler will call us some time mid-July to let us know if they've managed to get us on the timetable. 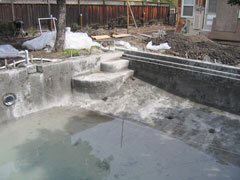 At this rate it doesn't look like the pool is going to be finished until November. Swan's management found out about my little web diary here. They're pretty angry about it, but on the bright side, they suddenly discovered that the tile installers are now free and can come to do our tile tomorrow. 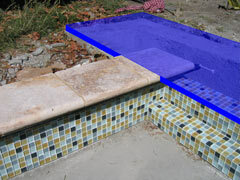 The tile installers did a nice job on the water-line tiles. Now the rails for the walk-on cover are installed. Six weeks past Swan's estimated completion date. 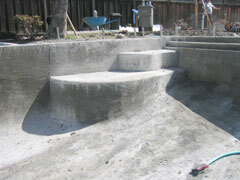 Now the coping is installed. 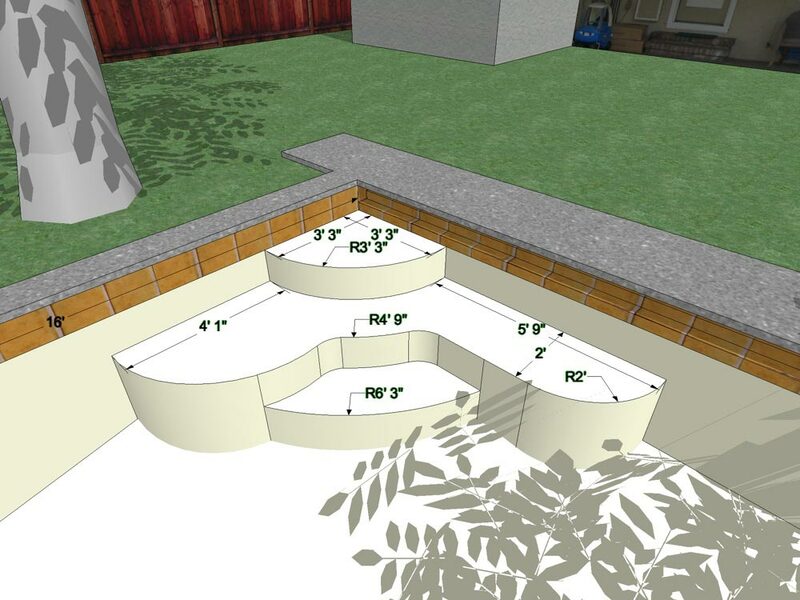 I think they forgot that we're having the hidden-lid pool cover, because the coping should stop about eight inches short of where it currently is. We'll have to see what Swan can do about that. 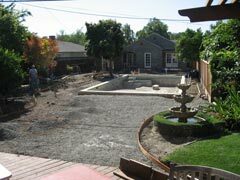 The next step now is the garden landscaping. For some reason, the way pool companies work is that even though they can build the entire concrete swimming pool, you have to get someone else to pour the 4ft x 8ft concrete pad that the swimming pool equipment will sit on. That means the ball is now in the hands of the garden landscaping contractor. Roughly six and a half weeks past Swan's estimated completion date. First week of garden work. The garden contractor has cleared away all the old lawn, plants, and rubble. Third week of garden work. 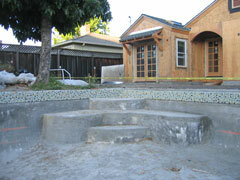 The wooden forms are in place, and the base rock layer is going in. Fourth week of garden work. 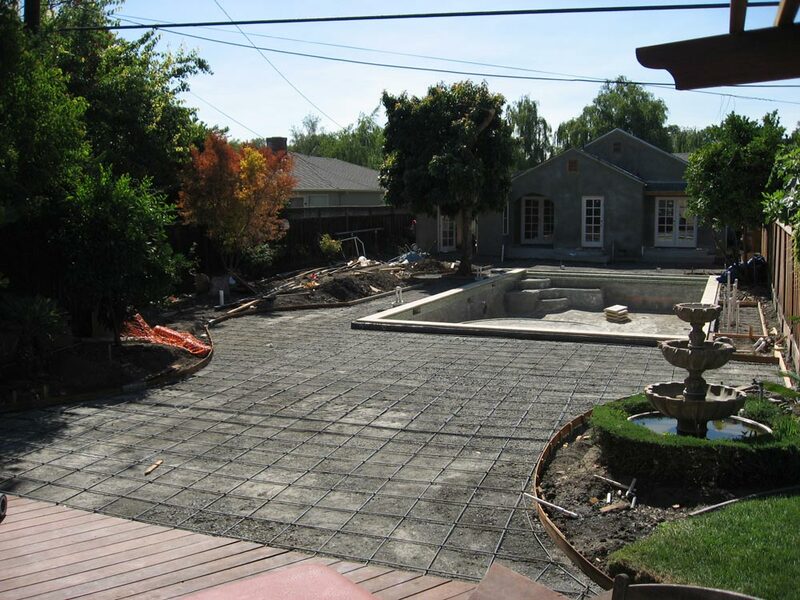 The steel reinforcing bars are laid out, waiting for Swan to arrange for the city building code inspector to come out and do the "predeck inspection". 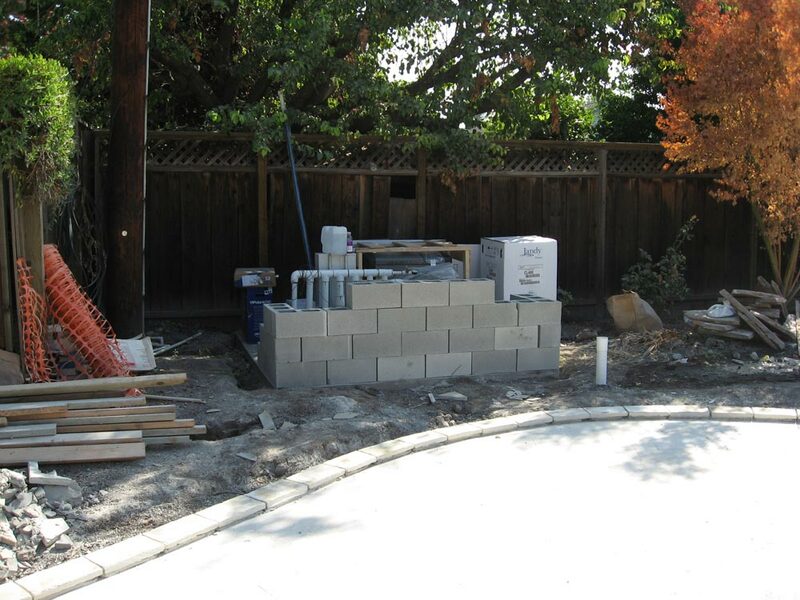 We're now roughly ten weeks past Swan's estimated completion date, but to be fair, four of those weeks aren't Swan's fault because that's the time it took the garden contractor to clear the land and get to the point of being ready to pour the concrete, so we'll count it as six. Seven weeks past Swan's estimated completion date (not counting the four weeks for landscaping work). The city inspector checked everything and signed off the "predeck inspection" Tuesday 18th, and two days later, Thursday 20th, the garden contractor had completed the concrete. 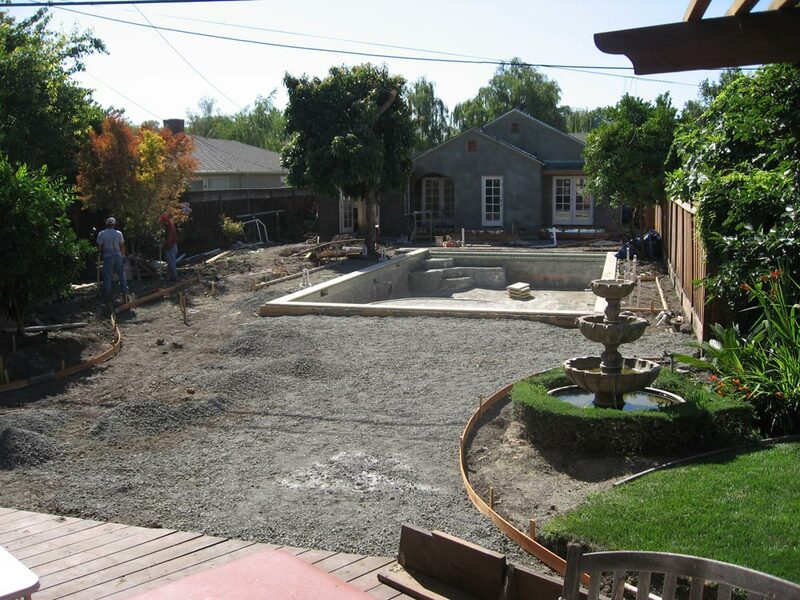 Now the ball is back in Swan's hands, so to speak, and they are clear to proceed with installing the pump, heater, and filter equipment on the concrete pad, install the solar panels, and complete the rest of the pool. In parallel the garden contractor will begin installing the flagstones. ...and Swan delivered the pool equipment. 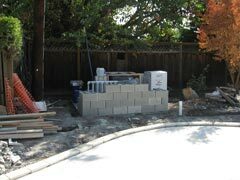 The garden contractor has begun installing the border stones. 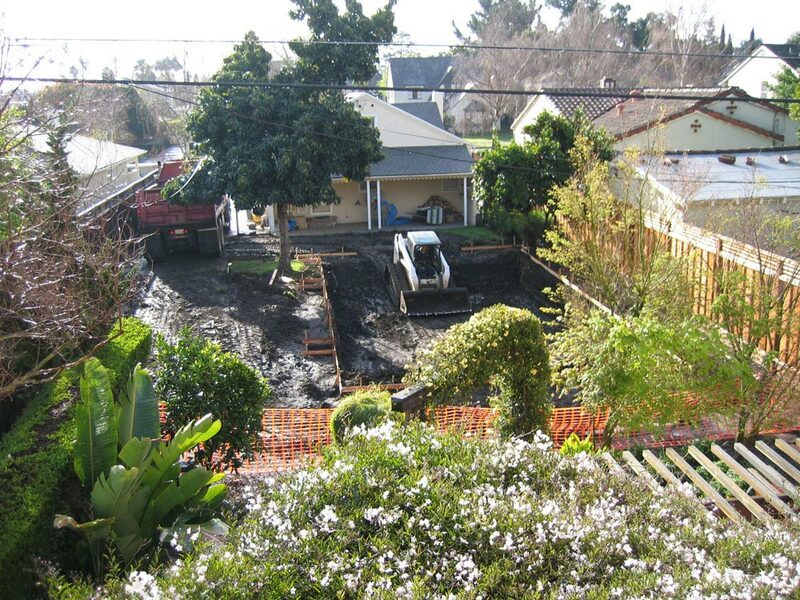 I wonder if Swan or the garden contractor will be finished first. 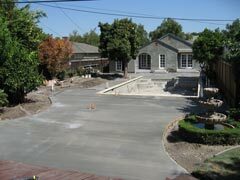 Eight weeks past Swan's estimated completion date (not counting the four weeks for landscaping work).